In the spirit of the site's new wider spectrum of commuting options, today we'll feature the first product review for walking and busing commuters: NEOS Overshoes. One of the big issues with walking to work or taking the bus is the weather, obviously. No one likes to trudge around in the snow and rain on a nasty day getting their shoes wet. It damages the shoes, makes you uncomfortable the whole day with wet socks, and it makes the experience of getting some exercise while getting to work a lot less enjoyable. But it's also a pain to carry one pair of shoes while wearing another, or keeping one pair at work just to change into, etc. When thinking about this issue, I recalled the days of my youth, when my dad wore rubbers (no, not that kind) or galoshes to keep his work shoes dry during the winter. And that started me on a search for a similar product, something simple that would allow me to simply pull my boots on over my shoes and not have to worry about those issues. Enter NEOS Overshoes. They're exactly what they sound like: boots that fit over your shoes. They come in insulated, non-insulated, and their STABILicers models to give extra traction in icy conditions. You slip your foot in, perhaps give the toe a little tap or kick to properly seat your whole foot in the boot, and then tighten the boot over the top of your foot with a strap and stick your pant legs into the boot's top to keep that dry and comfortable as well. It tightens with a cinch at the top to keep stuff out. And that's it. They're stable, light, well made, and warm - even the non-insulated models. I personally have the "Villager" model, which I bought at Hat & Sole in Bexley. This is my third winter wearing them, with literally no wear to them. I wear them with work shoes and casual shoes, for walking to/from work or playing with the kids in the snow. I wear them in the rain as well (which has been more an issue this winter than snow, frankly), and they keep my feet and pants cuffs dry and comfortable. They protect the shine on my work shoes nicely. And the traction is wonderful - I've NEVER had an issue with slippery ground, even without the special STABILicer models. The only downside, in my humble opinion - they make your feet look a little huge. That's the effect of having a boot that fits over your shoes, no way around that. And if you'll pardon me being a little snarky, the looks you get walking down the street wearing them in the rain or snow while everyone else is suffering with work shoes getting wet and pants cuffs getting soaked are priceless. I'm all about minimalism in my commuting, as many of you may know. I want to throw something on and go, whether it be by bicycle or on foot. 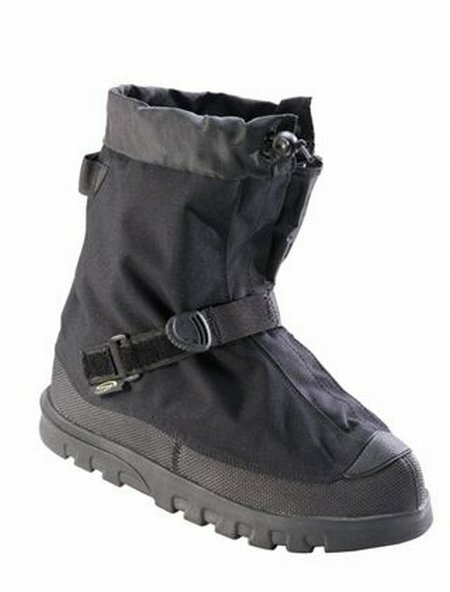 And with NEOS Overshoes, I can throw them on over my work shoes, get my normal coat, and an umbrella, and just go. No need for special rain wear or anything like that, no need for carrying around a pair of shoes to change into, etc. They're convenient and effective. I recommend buying them in person, and trying them on with the shoes you'll wear with them the most. Easton Shoes at 1880 Henderson Road in Columbus is listed as carrying them, and as I mentioned, Hat & Sole in Bexley is where I bought mine (though they are no longer listed on the NEOS website as carrying them, so call first). I have a pair of the Explorers. Keep my feet warm into the negative digits during my winter commutes.